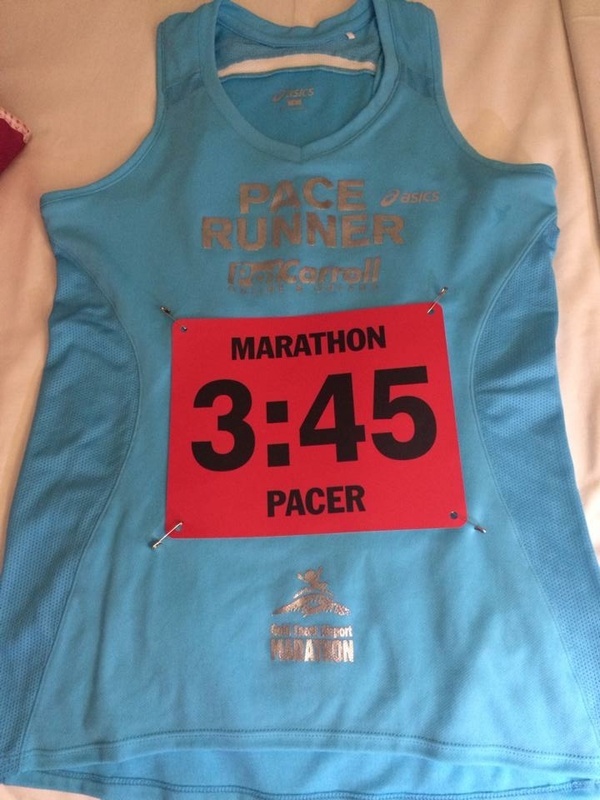 Marathon #21 was my chance to tick off my next running goal for the year: to be an official pacer for a marathon. 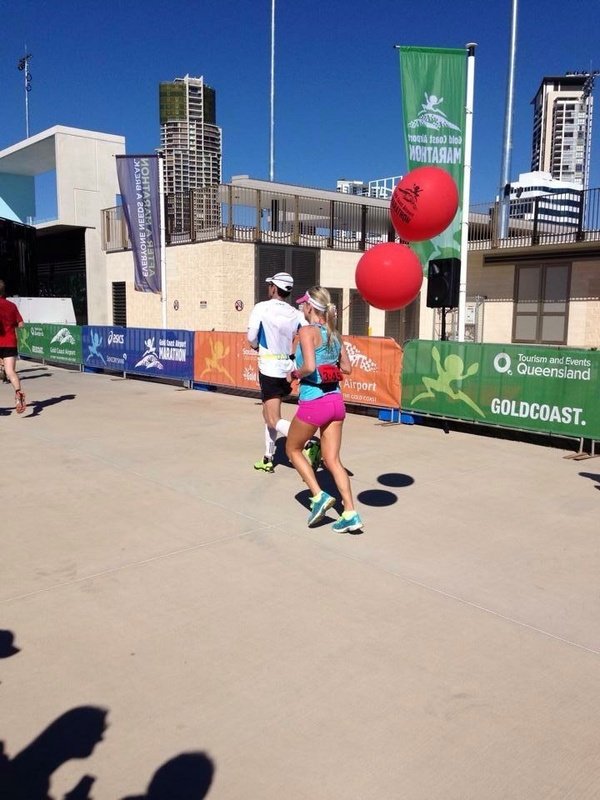 I had applied online to be a pacer for the Gold Coast marathon, and was thrilled to be accepted as the 3 hour 45 minute pacer. My duties began on Saturday, when I had to man the pacing booth at the expo for a few hours. I signed up people who wanted to run with a pacing group, handed out pacing wristbands, and fielded questions such as what to eat for dinner the night before, or breakfast on race day. Against my own advice, we went to Hogs Breath Cafe for dinner, and topped it off with the most delicious Turkish delight-flavoured gelato I have ever had the pleasure of tasting. 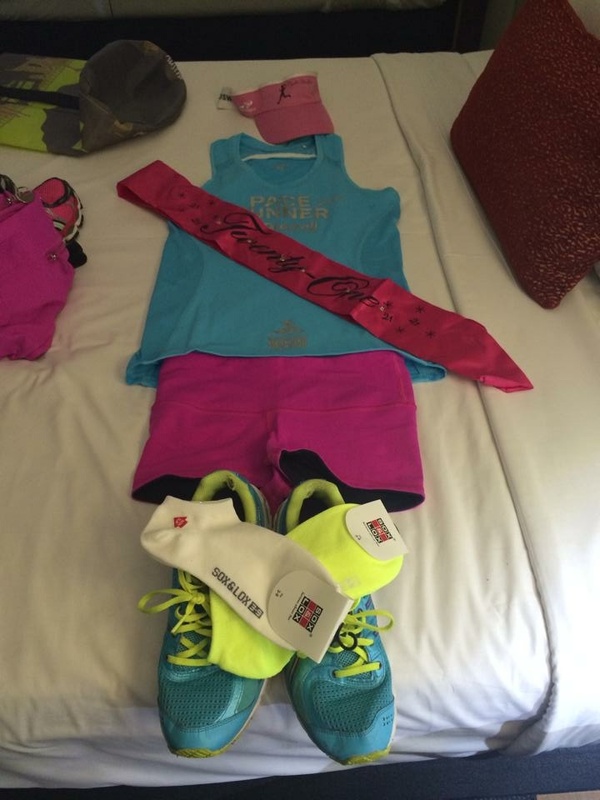 I laid out my race gear for the next day, and set the alarm for 5am. Race day morning was chaos because we had to pack up all our gear and check out before heading off to the race. 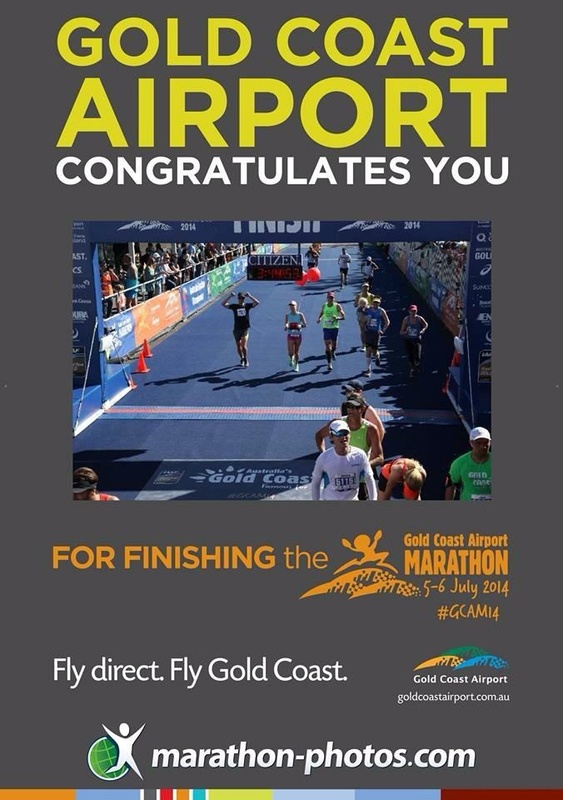 We did so, and then headed up to the Gold Coast Highway to jump on a shuttle bus to the start. The bus ride seemed to take forever. It was dark outside, and I had no idea where we were. Rich and I met up with Cheryl, Vlad and Helen, and headed to the start line. The first thing I had to do was find the Pat Carroll tent to collect my balloons. Easier said than done! I never would have found it if I didn’t see a man with a PCRG jumper on. I followed him to the tent. I collected my pacing balloons, and had them tied onto my shirt so other runners could easily see me. Then it was time to make my way back to the baggage drop, which was where a bunch of us had agreed to meet. Kirby and Rich, ready to Race! Before too long, it was time to head to the start line. I said goodbye to Helen, Cheryl and Rich, who were off to run with the fast people in the ‘A’ corral. Kelly, Mel, Kara, Nicole and I jumped into the ‘B’ corral. I found Graham, my other 3:45 pacer. He would be running off net/chip time, starting his watch as he crossed the start line. I was to be running off the gun time. I would start my watch when the gun went off. 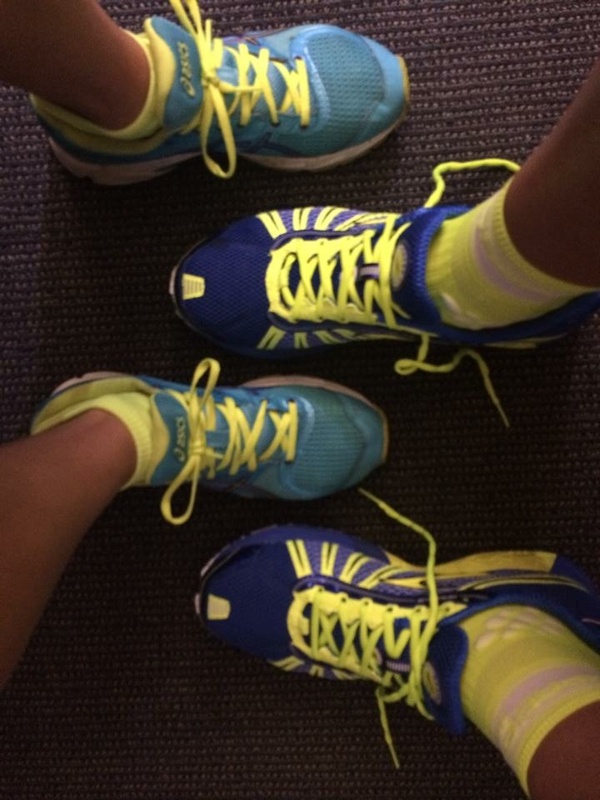 If it took us 2 minutes to cross the start line, I would have 2 minutes to make up. There would also be 2 minutes between Graham and I on the finish line, as my goal was to cross then the clock said 3:45:00, and a Graham would cross when his watch said 3:45:00. Over 42.2 km, this would average out at around 5:19 per kilometre. 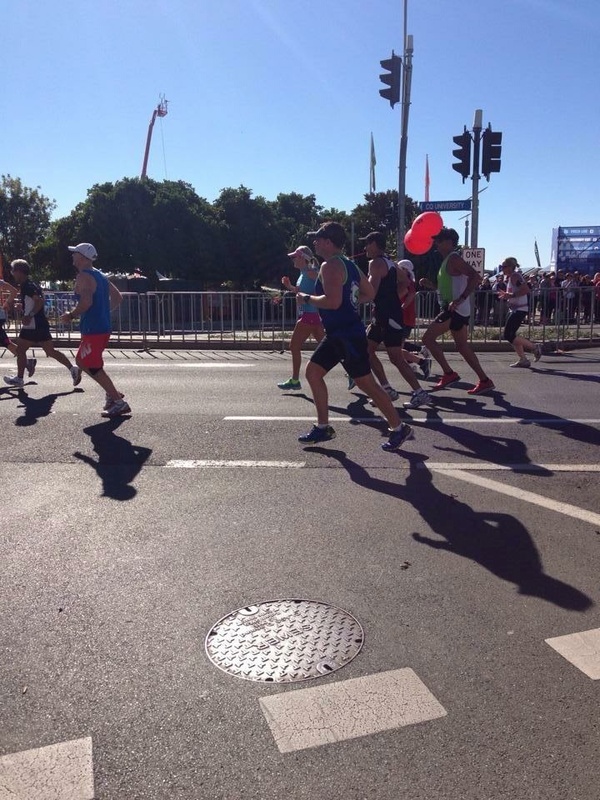 I was more nervous than I had been for most of my other marathons this year. People might actually be counting on my ability to run consistently today. I looked around me, at the runners who might be trying to run around 3:45. I recognised a few faces from the expo the day before. A few said hi. A few asked what the pacing strategy would be. The national anthem played, and runners began to shuffle forward. The gun went off and I started my watch. I looked up towards the start line. It was about 200m away. We slowly shuffled towards the start line, my watch already measuring the distance I was travelling. It was going to be out the entire race. i was so excited as we crossed the start line, I forgot to look at how much time had elapsed in the corral. I had no idea how much time I needed to catch up. the first kilometre was slow, like most first kilometres are. About 1km in, I looked over to see my other 3:45 pacer, Graham, running almost alongside me. “What are you doing?… Get going!” He said with a smile on his face. I accelerated. I had 2 minutes to make up. I was aware that Mel and Kara were near me, but I had no idea who else was running in my pace group. It was very crowded. 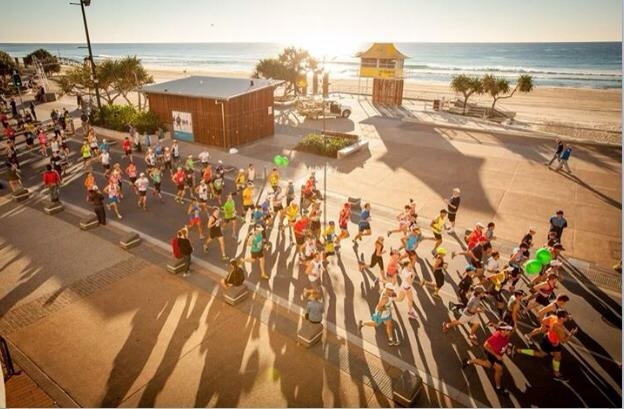 They sat that the Gold Coast marathon is a flat, fast course. It is flat, but unless you’re up the front with the fast guys, I don’t think it is particularly fast at all. Back with the masses, the first 20-30 km is very crowded, and I struggle to get into a rhythm, dodging other runners left, right and centre. I feel sorry for those trying to keep up with me, as I attempt to weave through runners who gave gone out too hard and are already starting to fade. By running close to 5:10 per kilometre, I should be able to make up the time I lost at the start by the time I reach the first turnaround at kilometre 15. I knew the race would be crowded, so I’m carrying a pop top of Gatorade with me, so I can avoid the first few water stations. I move to the right as I see the water stations approaching in my left, to avoid runners who have slowed or stopped to take a drink. A few km later, I pass Helen’s family, cheering from the sidelines. Her son Patrick spots me, holds up a new pop top, and asks if I want a drink. I want to take it but I’m running in the middle of the road, and I don’t want to cut off any of the other runners between me and the kerb, so I keep running. Patrick then proceeded to chase me for the next block and a half, until I can safely get across and take it from him. A couple of km later, the lead wheelchair marathoners fly past us in the other direction. Before too long, the lead marathoners pass too. They look like they are doing it so easy, and are absolutely flying. I am looking out for Vlad, but it is still so crowded where I am running that I can’t even get a good view of who is passing by in the other direction. I saw Phil Tweed run by. Damn, I must have missed Rich. I thought he would have been in front of Phil. A few minutes later, I see Rich and yell out. He waves back. I have no idea what pace they are running. Either Phil has gone out really hard and is smashing it, or Rich is not running as well as he had hoped. A few minutes later, the 3 hour pace group passed, so I know they are on pace for a sub-3 hour run. My group and I continue towards the turnaround. Occasionally someone asks a question, but mostly they are pretty quiet. I thought I would be doing a lot more talking! Helen passes in the other direction, and then Cheryl a couple of minutes later. I had hoped they would be together. I give them both a wave and a shout. Helen is on track for Sub 3:30.
i reach the turnaround at the 15 km mark. Running back past the marathoners behind me is fun. 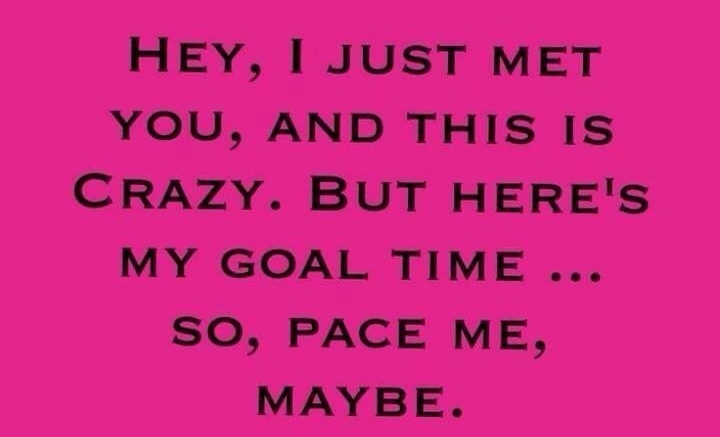 I wave to Graham, my other pacer, who is about a minute behind me, and all the other Night Striders that I see. Lots of them call out to me too, which is really nice. I guess my balloons make me quite visible. I see many people I know on the Sidelines too, Karen, Adam and Ange, and all the night Striders who have completed the half marathon. Patrick hands me another pop top as I pass. At the halfway mark, we are right on pace for our 3:45 finish. I’m feeling good, and hope all the other runners are too. Just after 30km mark, we pass the start/finish area. I have exhausted all of my pop tops. It’s time to start drinking from the water tables. Thankfully, the roads are wider here, so it feels as if the crowds have thinned out a little. I look over the other side of the road and see Richard passing, heading for the finish line. I yell out to him, but he doesn’t look up. I cross my fingers that he will do a PB. A few k’s later, I was about a minute in front of where I was supposed to be. This would allow for a bit of fade in the last 5km, particularly if there was a strong headwind like there was last year. I heard someone call out to me, and looked across to see Cheryl bent over on the side of the course. I wanted to stop and help her, and get her to run with me, but I had the group with me. I hoped she would understand. I shouted encouragement, and wished that she would be able to get back out there and finish the race strong. I saw Helen pass by in the opposite direction, with only a few km to go to the finish. She was closely followed by Kelly, who was looking good. I was starting to feel like the turnaround was never going to come. I thought it was at the 36 km mark, but it was closer to the 37km mark. Turning for home was a good feeling. Despite the fact that I was running a reasonably comfortable pace, my legs were really starting to ache, and I would be glad when this was over. I was still about 40 seconds up, and there was no headwind. I dropped the pace by about 10 seconds per kilometre, so I would come in as close to 3:45 as possible. I waved to my other pacer again as he ran past. As we approached the 40km mark, I looked at the big digital clock above the road. ’25 seconds in front’ I said to the runners around me. If they could maintain this pace for about 11 more minutes, they would end up with a net marathon time of 3:43. I passed Matthew Roberts, walking. I called out to him to jump onto my run train, but he said he couldn’t. I find it hard to run past people I want to help, I would love to be able to run the last few km for them. But I had to keep going. The end was in sight. With 1km to go, I told the runners around me to get going, they were nearly there. Anybody who was still with me promptly took off as we reached the top of the finish chute. The chute was long. I could see the clock above the finish line. 3:44:35…. 3:44:46…. 3:44:37…. I crossed in 3:44:55, 5 seconds under my goal of 3:45:00. 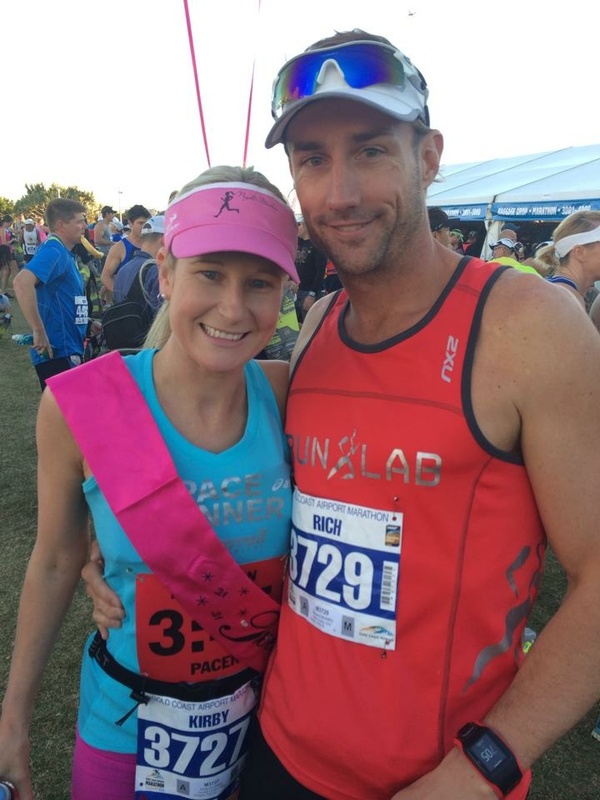 To be 5 seconds off over 42.2 km is pretty good…. Nailed it! A few people came up to me after the race and thanked me. I hope they all achieved PB’s. 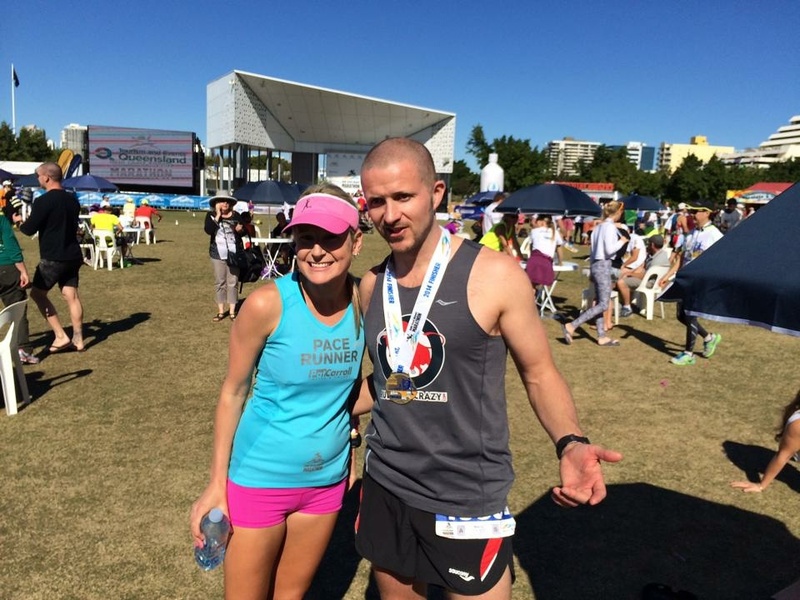 I thoroughly enjoyed pacing, and would love to do it again. I collected my finisher’s shirt and medal, and made it to the presentation area just in time to see Vlad get awarded 3rd place for the Australian Marathon Championships, on his Birthday too. Congratulations Vlad. While we were all sitting around on the lawn recovering, I looked over to see Tristan Miller, author of “Run Like Crazy” (52 marathons in 52 weeks) – it is the book that I am reading at the moment. Kara is reading it too. We went and got our photo taken with him. I told him that his book was giving me more crazy ideas of all the races I want to run in the future… And I’m only up to China! 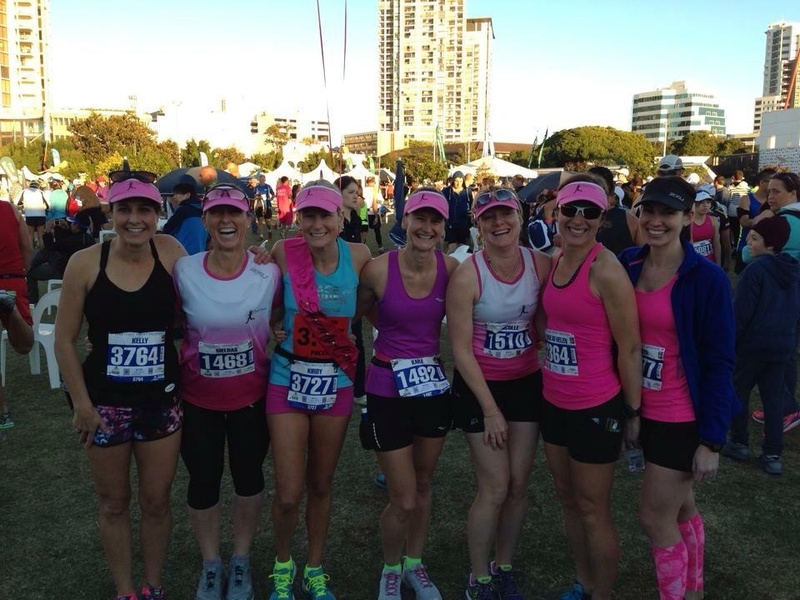 I was overwhelmed by all the support on course from all the other Newcastle runners. Results are listed below. Congratulations to everybody who took part. I hope I haven’t missed anybody! Sounds like it was a great race! I love pacing, too! Congratulations on your success. Thank you. I look forward to pacing again in the future! Perfect timing! It has to be challenging to know there are people relying on you to make their time goals. Great job! Thanks! Yes,mi found trying to run consistently just as challenging as trying to run fast! You’re starting to be pretty good at this marathon thing! Well done!